The two main types of TV Aerial Cables are plug to plug (male to male) or plug to socket (male to female), plug to plug cables are used from an aerial wall plate to a TV or Digibox, plug to socket cables are used to connect between boxes or from a Digibox to a TV. For mounting a TV close to a wall an Angled Aerial Cable may sometimes be required. Aerial cables are manufactured with low loss 75 ohm coaxial cable. F-Type Cables are a screw on coaxial aerial cable which can be used as Satellite Cables for the connection between a satellite dish LNB and satellite receiver and also as Virgin Media Cables. It is also possible to extend existing Sky Cables or Virgin Cables using Satellite Extension Cables. Many satellite systems, including Sky Plus and Sky HD use two cables between the dish and receiver, these can be connected using either 2 single cables or a Dual RG6 Cable, sometimes referred to as Shotgun Cable. Aerial adapters are available to convert between standard TV IEC connectors and F-Type connectors. If you live in a weak signal area or are suffering from a broken TV picture a TV Aerial Booster can often help, they amplify and split a TV signal and help to overcome losses in the cables. 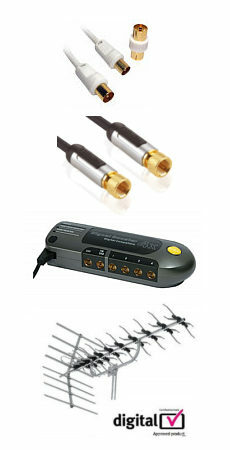 TV Aerial Amplifiers should be mounted as close as possible to the TV Aerial to gain the best performance. TV Signal Boosters are available with F-Type screw on connectors and push fit IEC connectors, they require power but some types can be powered using a remote power supply via the aerial cable itself. The key to getting a good TV picture is to use a good TV Aerial, unless you live very close to a TV transmitter best results will be obtained using an aerial mounted high up on a roof or in a loft. Megaboost TV Aerials have a built amplifier which help in weak siganl areas.